I’m pretty sure that I’ve said this before, probably on one of my opinionated articles on a Harry Shannon book, but the zombie subgenre is getting old. It surprises me how it just keeps on ticking without even a sign of it slowing down. The subgenre, in itself, is like a slumbering, moaning creature that should be dead but keeps on coming. A zombie of which you cannot shoot in the head, no matter how hard you try, and put an end to the whole thing. But saying such things makes me a hypocrite. I still read about zombies, even though I’m tired of them. But every once in a while, an author has an interesting idea, or something new they can offer to an over-bloated genre, and I think that Hive, by Griffin Hayes, is quite possibly that. I say possibly, because Hive is just the very beginning of a new series, and the story itself, an action packed romp through a long abandoned mall, packs some serious heat. Taking place two-hundred years after the initial zombie apocalypse, Azina and her team are sent into said mall after a group of Prospectors have gone missing. Somehow, and I’m not sure why, the story reminded me of Aliens, and I couldn’t help but think of the character, Bron, played by Ron Perlman. Which brings me to Griffin’s strength, of which seems to have even improved since the first book I’ve read by him, Malice. His strength is in his characters. They all have their own personalities and never stray from what is at their inner core. They feel like real people. And they are fun to follow. 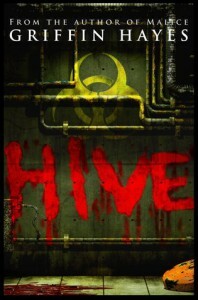 The only thing that bothered me about Hive was the first-person, present-tense narrative. Although it worked for the most part, there were times where it felt like the story should have been told in the past-tense. It seemed as though it might have been written the first time around in the past-tense and then was switched to the present-tense for whatever reason. But seriously, all nitpicks aside, if you’re looking for a fun time with the ancient undead, I implore you to give Hive a try. It’s cheap, it’s short, and most implortantly, it’s terribly fun. I’m excited to see where this series is going and what Griffin will do with these characters he’s created. Come along for the ride. It’s bound to be interesting.